"Bohemian Rhapsody," the record-breaking hit by rock band Queen, is Britain's favorite single of all time, according to a poll published today (May 8). The song beat John Lennon's ballad "Imagine" to claim the top slot in a poll by "British Hit Singles," published by Guinness World Records. Accepting the award with Queen drummer Roger Taylor at London's Dominion Theater, guitarist Brian May said the hit song "has become a classic phenomenon and one which no one will ever allow us to forget. Thank you, people, for the memory." "Bohemian Rhapsody," a six-minute epic that first topped the U.K. singles chart in 1975, made it to No. 1 again in 1991 when it was re-released to raise funds for charity following the death of the band's lead singer, Freddie Mercury. It became the first single to top the charts twice in the same version. It is also the only song to have hit the No. 1 spot twice at Christmas. In all, the song has spent a total of 14 weeks at the top of the charts. Because of its complex harmonies, it was difficult to reproduce and the band was unable to perform it live. Half the top-10 songs listed in the poll are by Lennon and the Beatles: "Hey Jude" (No. 3); "Penny Lane/Strawberry Fields Forever" (No. 7); "Yesterday" (No. 9) and "Let It Be" (No. 10) all made it. The most recent single in the top-10 is Robbie Williams' "Angels" at No. 6. ABBA is at No. 4 with "Dancing Queen," followed by Madonna's "Like a Prayer" at No. 5. "Wannabe" by the Spice Girls is at No. 8. Guinness questioned more than 31,000 people for the poll. I thought I'd belatedly mention the news concerning a recent UK poll which named Queen's Bohemian Rhapsody as the top pop/rock single of all time. Interesting Poll. My top two would have been the same, but after that.....well. I can't believe that such forgettable pop groups like All Saints and Spice Girls made it on the list, let alone crack the top 30. Wow! I can't believe Radiohead isn't even in the top 100! I thought 'Street Spirit' was HUGE over there. .... Led Zeppelin tended not to release any singles in the UK. 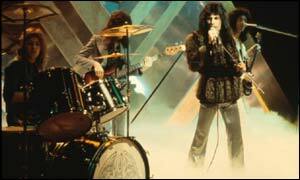 Ironically, off and on for many years, "Whole Lotta Love" has been sampled as a main part of the theme tune for the the top UK singles chart show: "Top of the Pops"! RolloTomasi, I too think that there seem to be far too many transient bands in the listing: a lot of enduring talent is missing, IMNSHO. It is weird that such items as the Steps cover of the Bee Gees' "Tragedy" should feature rather than the original. But, given that it is based on UK singles, what would you add to/remove from the Top 30? North American performers manage a fair showing in the Top 30 and do equally well in the Top 100. For context, here is the current chart: link. Last edited by benedict; 05-13-02 at 05:31 PM. Hate Queen, though. "Bohemian Rhapsody" makes me wanna put my fist through a wall. View Next Unread I'm curious - new Zakk Wylde/Black Label Society - what do you think?